Whew, it was a busy day. First off I finished off the 2ND garden bench today which entailed positioning the top and securing it and then urethane it. Man is that thing heavy. I used my dolly and still had to take several breaks to move it from the garage all the way around to the canal. Anyway, it looks good. Both benches received a second coat of urethane late yesterday evening and with just one more quick coat in the morning I'm calling the projects done for now. 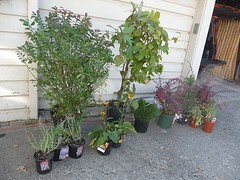 So when I went to the Depot to purchase urethane I saw that they had all live plants on sale for 50% off. 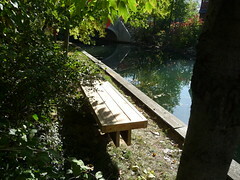 Well, I can't refuse a deal like that and it would be nice to "landscape" the back by the new bench and I could replace that peony for something that isn't deciduous and I wonder if they have something for along the canal to keep the kids from climbing into my yard and fishing. CHA-CHING! I found a plethora of plants to suit my every need! 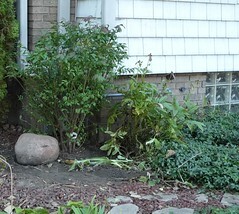 I wasn't sure how many plants I would need for the front by the bridge and wound up going back and purchasing 4 more of the picker bushes to complete the job and bought a Japanese maple on the second trip too (those 5 plants aren't in the picture). 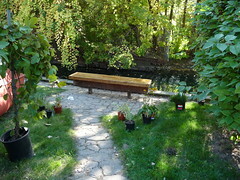 The New Bench Landscaping Project: I decided a few days ago that I'm going to build an arbor to go down the new bench by the canal in the backyard. I have not started this project yet, but have gotten the materials. Well, you can't have just an arbor with no plants so when I saw the 50% off at the depot I couldn't resist and went crazy and even got vine for the arbor. Here's a quick plan that I set up. I haven't begun the installation of this yet mostly because I didn't have time plus I'm still deciding on how I'm going to present the approach to the arbor. 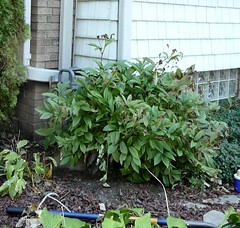 when the peony dies off for the winter the meter will be an eye sore. So I figured a bush would be better and I do like the Burning Bush fall color. 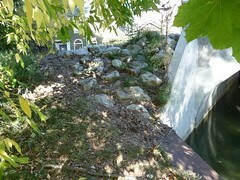 The Bridge Project: Wow, I'm digging through rocks! Finally I got 6 substantial size holes dug 3' apart that hopefully will have enough dirt for the 6 picker bushes to thrive in. By the time I returned from the Depot it was dark so I continued my landscaping endeavors by lantern and head lamp. LOL.